Pulse Research conducts an annual national purchasing survey. 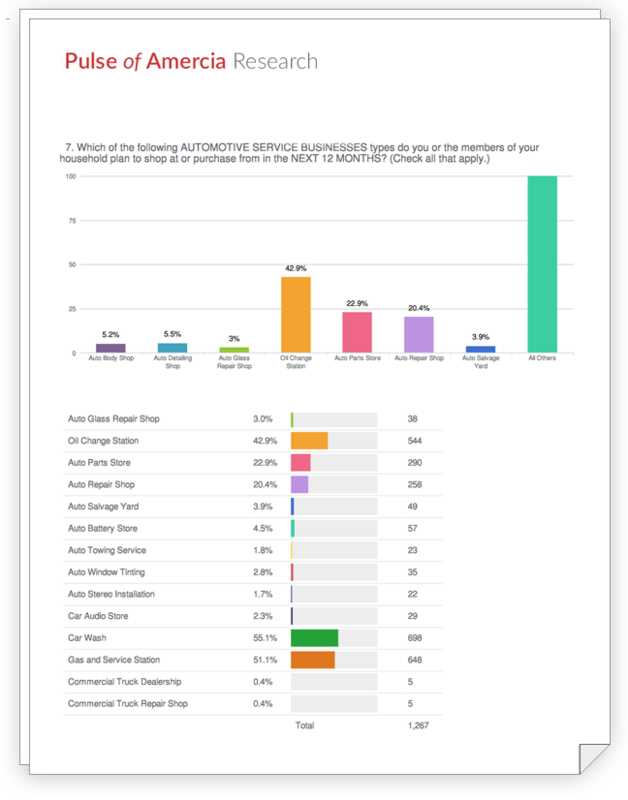 The Pulse of America survey captures shopping and purchasing intentions and spans 550+ business types as well as several thousand products and services. Just promote the survey and we provide the research results. To get started, just run an ad, or send an email to your loyal audience. We will provide email blast options and ready-to-use ads for both web and print. See the current example ads, below. Just get a few responses to the survey, so that we can verify promotion - is all that is needed. 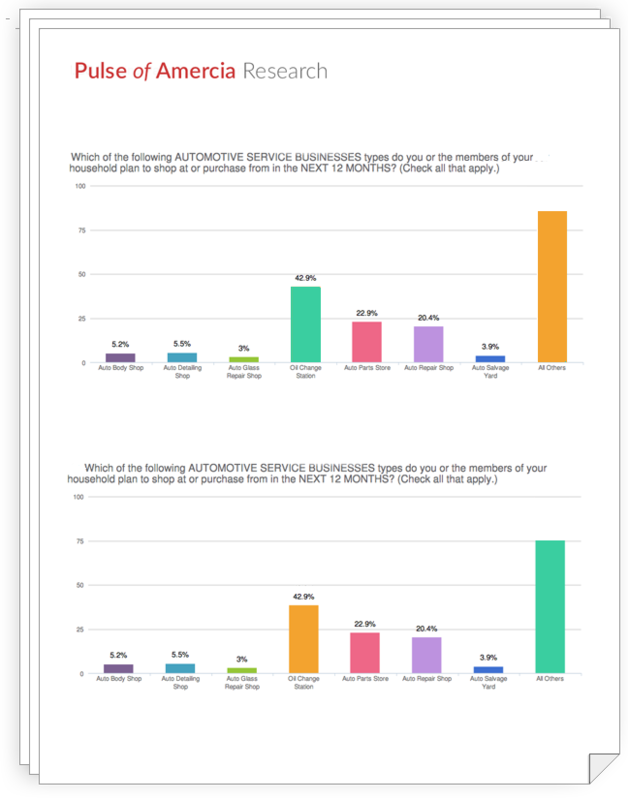 The more survey sample you get, the more your audience is represented. Once the survey is completed at the beginning of January 2018 - we will send you the POA results. The results will give you shopping intentions for 580 business types and over 1000 products and services. By participating in the Pulse of America shopping survey, Pulse Research will be providing you with the results of the Pulse of America survey. Your sales staff will have the most current consumer product and service purchasing plans for effective sales presentations. It's simple to participate: Just invite your readers & website visitors to participate in the survey. Run small house ads inviting your readers to in the Pulse of America consumer survey and publish a link on your website to the survey. Click on a size below to download the print advertisement(s). All ads are PDF files, saved in 300 ppi resolution. If you need a size that is not available below, please contact us. To place these ads onto your site using our ad code, please follow the steps below. You will only need to place the ad code once; future ads will then be updated automatically to your site. Note: If you are already using another ad script platform, you may save the images below and upload them as creatives through your own platform instead. 1. Copy & paste this code below and paste it into the <head></head> section of your page. 2. Copy the code for one of the ad sizes below. 3. Paste the ad code from Step 2 into your web page's code exactly where you want the ad to appear. 4. If you wish to display more than one ad, repeat steps 2-3 for each ad size. 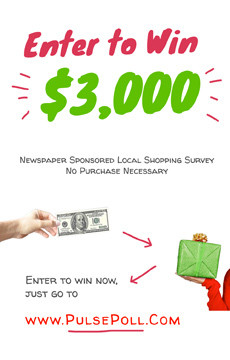 Win a $3,000 grand prize! or one of ten (10) $100 prizes! 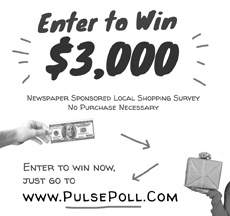 Take our survey at www.pulsepoll.com and tell us about your media usage and shopping plans. Your input will help this paper help local businesses. Thank you! 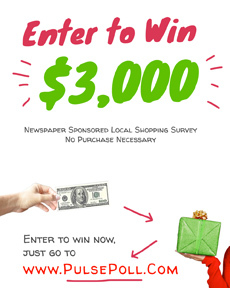 Win $3,000 in cash and prizes! Enter to win. Take our survey at www.pulsepoll.com and tell us about your household shopping plans and media usage. 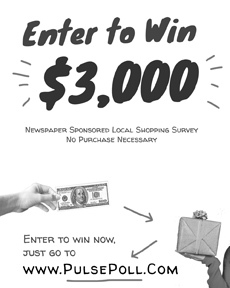 Your input will help us improve the paper and get the advertising specials you want. Thank you! The economy is showing signs of turning around, but what does the coming year hold for businesses in our area? Here is your chance to be heard and to help us help local businesses. 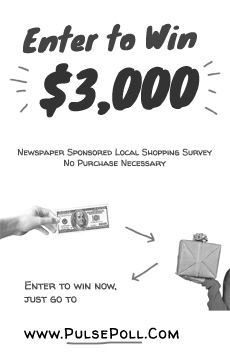 To thank you for taking the time to complete the survey, $3,000 in prizes is being offered! The current economy is a real challenge for many LOCAL businesses (perhaps even your own business or that of a friend or relative). 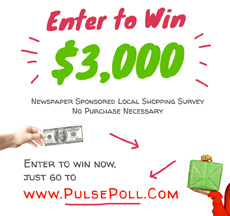 By completing the Pulse of America survey you will help in estimating the economic climate of our local community in the hopes that we can help local business, provide our valued readers and website users with advertising information they need, and to strengthen our community at large. We have partnered with Pulse Research, a nationally respected research company, in the Pulse of America project. 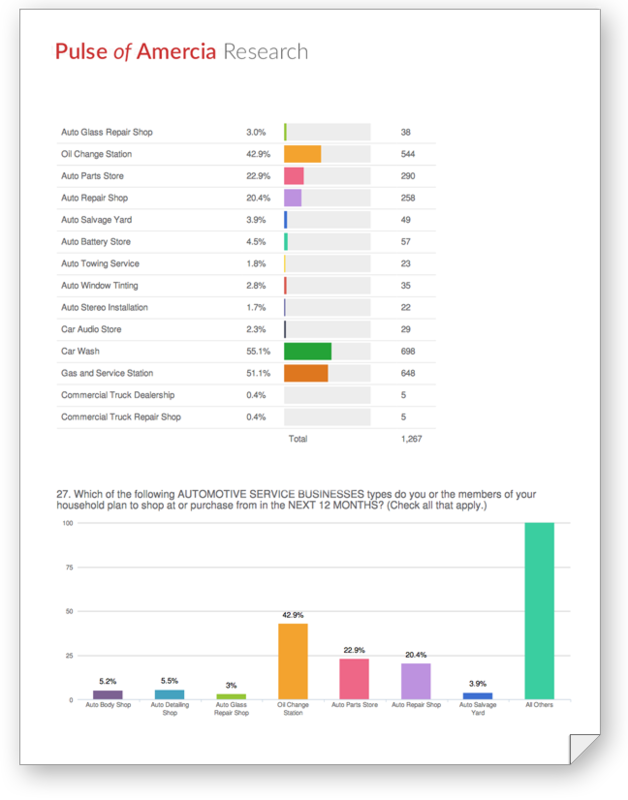 The survey is approximately 30 minutes in length and primarily focused on shopping plans and media use. Once completed we will share the results of the survey with local businesses. Your responses are completely confidential.